Crowdfunding Campaign Offers Dinotastic Rewards! Just over one hundred and twenty days to wait before the opening of the “Dinosaurs of China – ground shakers to feathered flyers” exhibition in Nottinghamshire. As the countdown continues, a crowdfunding campaign has been launched to give dinosaur fans and prehistoric animal enthusiasts the chance to meet palaeontologists and to get up close and personal to some of the best-preserved dinosaur fossils on the planet, many of which, have not been seen in Europe before. The campaign is being run by the University of Nottingham’s Lakeside Arts centre as part of the world-exclusive “Dinosaurs of China” exhibition. Featuring such amazing dinosaurs as the mighty Mamenchisaurus and the bizarre Gigantoraptor (G. erlianensis), standing five metres high and weighing as much as a sixty eight-year-old children, this summer event is not to be missed. Supporters of the crowdfunding campaign will have the chance to earn rewards including experiences that money-can’t-buy and to gain privileged access to the exhibition. For those who can travel to Nottingham, a pledge of £20 GBP to the crowdfunding campaign will be rewarded with entry to an exclusive lunchtime lecture at Nottingham Lakeside Arts, or £70 GBP will secure one of just thirty tickets to an intimate “Meet the Experts” reception, to learn about the exhibits in more depth with the chance to discuss the fossil finds with the team behind their discovery and excavation. For £50 GBP, you can even be among the first in the world to get access to the exhibition, with a ticket to the VIP opening night on 30th June. Young explorers aren’t left out either, a pledge of £40 GBP to the crowdfunding campaign will be rewarded with a one-hour story telling workshop for a family of four, or a donation of £50 GBP you can secure a hands-on experience with some of the rare exhibits. If you have £100 GBP to spare, young explorers can become a palaeontologist for the day, joining “Diana Saurus”, Lakeside’s very own dino-safari character as she explains about the dinosaurs from the Far-East and discovers the story of how these prehistoric animals evolved. The “Dinosaurs of China” exhibition logo. Those further afield can still support the campaign – a pledge of £25 will be rewarded with a limited-edition print; or a Twitter “roar-out” can be gained with a donation of just £5 GBP. Coming to two locations in Nottingham this summer, Wollaton Hall and Nottingham Lakeside Arts, the Dinosaurs of China exhibition will feature twenty-six of the best-preserved dinosaur fossils in the world, with recently-discovered specimens, some as recently as 2015, which have never before been seen in the UK. These include Mamenchisaurus, the tallest dinosaur skeleton ever seen in the UK and Yi qi, a weird bat-like flying dinosaur discovered in 2015. The crowdfunding campaign has been set up to support the creation of a dinosaur legacy at the University of Nottingham’s Lakeside Arts centre, to inspire and teach the next generation. The target of £3,000 will be used to build an animatronic baby dinosaur, to teach children about how one group of dinosaurs evolved into the birds that we see around us today. For further information on the crowdfunding campaign and the rewards available visit: Crowdfunding campaign for “Dinosaurs of China” exhibition. To find out more about the Dinosaurs of China exhibition or book tickets, visit: “Dinosaurs of China”. When it comes to accurate, quality models and figures, the enthusiastic team members at Safari Ltd have built up quite a reputation amongst collectors, educationalists, parents, grandparents of course, children. Within the prehistoric animal model range, the company can boast a number of award winners, For example, recently, the Wild Safari Prehistoric World Iguanodon model was voted the best prehistoric animal toy figure released in 2016 by readers of the influential “Prehistoric Times” magazine. This accolade follows on from similar recognition being awarded to the company’s excellent Sauropelta. Back in 2015, in a survey of the best prehistoric animals undertaken by “The Dinosaur Toy Forum”, Safari Ltd models occupied three of the top eight places. The model of the armoured dinosaur Sauropelta came out on top. Once again, dinosaur fans and collectors were recognising the efforts the company puts in when it comes to designing figures. Safari Ltd’s philosophy is to create models that excite, fire the imagination and educate. After all, you can learn whilst having fun. At Everything Dinosaur we share this mindset and as we prepare for another busy week of delivering dinosaur and fossil themed workshops in schools, it is worth reflecting on the contribution to children’s education that organisations like Safari Ltd make. For instance, the company provides an educational resource which allows visitors to learn more about the animals that inspire the Safari Ltd design team. Entitled “SafariPedia”, the company has developed the concept of providing “toys that teach” and introduced a database that provides interesting facts and information about the animals in their range. The “SafariPedia”portal is divided into various categories, in essence it reflects the main product lines of the company. There is a farm section, fantasy, a dogs and cats category, a section on birds, sea life and of course wildlife. Our attention was drawn to the “dinosaurs” section of the portal. Like all the various categories that make up the “SafariPedia” database, the prehistoric animals are listed alphabetically and when the name of any ancient creature is clicked, a new page opens up providing lots of information about that particular animal. The Safari Ltd company logo. We are sure that “Bernie”, the company’s alligator mascot would be proud, yes, there is even a section all about unusual alligators in the “SafariPedia” (look up albino alligators in the wildlife category). The “SafariPedia” concept elevates the company’s product range and demonstrates their commitment to education and to learning via creative play. It is an excellent resource for schools, home educationalists and for parents, as well as for model collectors keen to find out more about the animals and creatures that their figures represent. Our congratulations to Safari Ltd, to all their dedicated and hard-working staff who have taken their passion for what they do to the next level. That diverse and very complicated clade of Theropod dinosaurs, the Coelurosauria can prove problematical for even the most knowledgeable dinosaur enthusiast to navigate. This time last year, a new dinosaur from Japan was assigned to the “Hollow Tail Lizards” (that’s what the term Coelurosaur means), today, we reflect on that dinosaur’s discovery and what it means for dinosaur classification. Tyrannosaurs are members of the Coelurosauria. It was in February 2016, that a group of scientists including researchers from the Chinese Academy of Sciences and Japan’s Fukui Prefectural Dinosaur Museum, published in the journal “Scientific Reports”, a paper on a newly described Theropod dinosaur that had been assigned to the Coelurosaurian clade. This dinosaur was named Fukuivenator paradoxus, the name translates as Fukui Prefecture hunter with surprising characteristics. Fukuivenator replica on display at the Fukui Prefectural Dinosaur Museum. Known from approximately 160 fossil fragments, representing around seventy percent of the skeleton of a single animal, Fukuivenator’s remains were first noticed by a field team in the summer of 2007. They were exploring the Early Cretaceous exposures at the famous Kitadani Dinosaur Quarry, which is on the Sugiyama River in the northern part of the city of Katsuyama, Fukui, on the island of Honshu. The remains constitute the most complete non-avian dinosaur fossil found in Japan to date and remarkably, despite having lain in the ground for something like 125 million years, all the fossils were found within a matrix block measuring just half a metre by half a metre (around 0.125 cubic metres). The Coelurosauria clade consists of all those dinosaurs that are more closely related to birds than they are to Carnosaurs such as the Allosaurs. Essentially, the clade contains non-avian dinosaurs such as the Tyrannosaurs, Compsognathidae, Ornithomimosaurs and the Maniraptora, within which, is nested those avian dinosaurs – birds. Fukuivenator may only have weighed around twenty-five kilos, but in palaeontology it punches way above its weight, as the fossils reveal that this fast-running two and a half metre long dinosaur, exhibits a combination of primitive and derived features seen amongst a variety of Theropod groups. Its discovery showed palaeontologists just how diverse the Coelurosaurian Theropods could get. A reconstruction of the skeleton of Fukuivenator paradoxus. Whilst the bones of Fukuivenator show a large number of morphological features not seen in any other member of the Theropoda, it did have a combination of primitive and derived traits seen in different Theropod subgroups, notably the “raptors” (Dromaeosauridae). Phylogenetic analysis classified, what is arguably Japan’s coolest dinosaur, as a basal member of the Maniraptora. However, other studies indicate affinities with Ornitholestes, from the Late Jurassic of North America. Using computed-tomography, the delicate bones of the inner ear were analysed. The inner ear bones also showed a mixture of characteristics. The proportions of the bones were similar to those seen in other fast-running dinosaurs, whilst on the other hand, the length of the cochlea duct suggested that Fukuivenator might have had the same auditory abilities of modern birds. Its hearing could have been comparable to the hearing of the birds that we see today. The researchers concluded that with the discovery of Fukuivenator, the morphological variety within Coelurosaurian dinosaurs was certainly increased. Fukuivenator highlights the high levels of homoplasy (features shared by a group of species but not present in their common ancestor), in Coelurosaurian evolution. 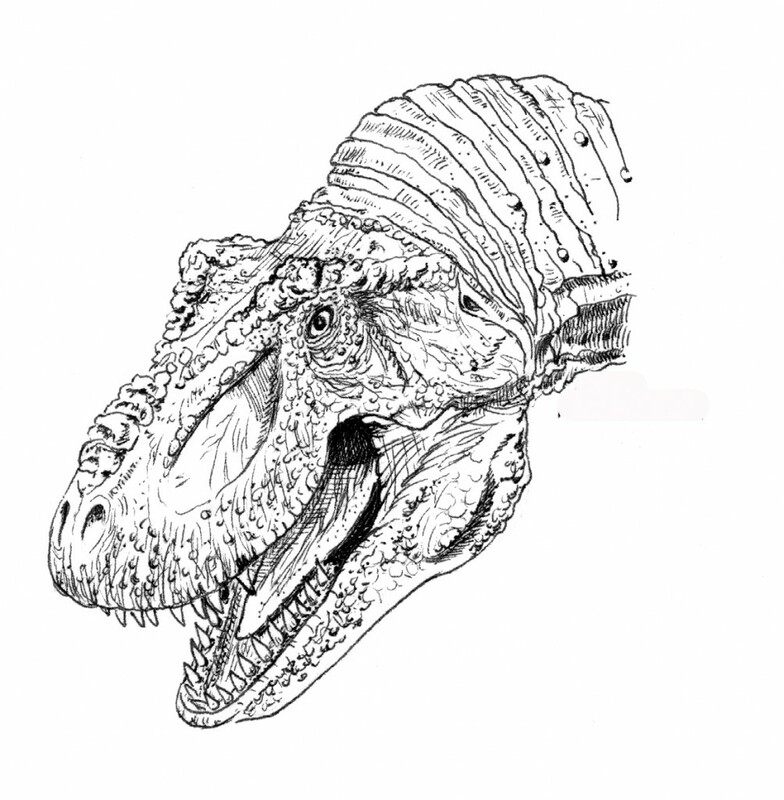 In addition, examination of the teeth, which although long and pointed, lacked serrations suggested that Fukuivenator may well have been an omnivore. Fukuivenator made the “Hollow Tails” even more complicated. A new species of Devonian worm, a giant with fearsome jaws looking like something from a science fiction film, has been named and described by an international team of scientists. Researchers from Bristol University, Lund University (Sweden) and the Royal Ontario Museum (Canada), have named the beast Websteroprion armstrongi, the genus name honours Alex Webster the bassist in the Death Metal band Cannibal Corpse. Writing in the journal “Scientific Reports” the researchers identify the creature as a type of polychaete worm (Order Eunicida). Polychaete worms, often referred to as bristle worms, have a fossil record that can be traced back to the early Cambrian. Their soft bodies are rarely fossilised but the jaw elements, often just a millimetre or so in length, are made from hardened material (sclerotin) and they fossilise quite readily. In contrast, the fossil jaws of this species are nearly 13 millimetres long, making it a giant amongst these types of worms. Eunicid polychaete worms are characterised by a dorsal pair of mandibles which contain toothed, maxillary plates. These plates are used to grasp prey, the scientists conclude that this new species of Devonian worm was also a predator, although the absence of any defined gut contents has prevented the team from making further comments with regards to this animal’s potential diet. Although the scientists, which included lead author Mats Eriksson (Lund University), cannot be certain how big W. armstrongi was, they have estimated that it was probably over a metre in length. It has been postulated that this worm might have fed by ambushing small fish, arthropods and cephalopods by shooting out of its burrow and grasping its victims in its hook-like jaws that were lined by rows of sharp, tooth-like structures. The jaws are the largest known in the Class Polychaeta. All the fossils that led to the naming of this new species, were collected in just a few hours in June 1994, Derek K. Armstrong, a geologist with the Ontario Geological Survey had the opportunity to visit a remote and rarely exposed portion of the sedimentary rock formations that made up part of the Hudson Platform located in the Hudson Bay Basin. The samples he collected proved to be Late Emsian-Early Eifelian (Early-Middle Devonian) age from the Kwataboahegan Formation and they were stored at the Royal Ontario Museum, until the authors decided to take a closer look at the fossil material. Fossils showing two jaw pieces (jaw elements) of Websteroprion. The picture above shows specimen number ROM63122 lit so as to give the fossils a positive relief, the scale bar is 1 mm. The fossil on the left of the photograph is a maxilla from the left side of the animal. The fossil on the right is a maxilla from the right side. David M. Rudkin (Dept. of Natural History at the Royal Ontario Museum), explained that there might be several, as yet not described species of Palaeozoic invertebrate, “hiding within plain sight”, amongst the museum’s extensive fossil collection. The species name honours Cannibal Corpse bassist Alex Webster, regarded as a “giant” when it comes to handling his instrument, according to the researchers. The species (trivial), epithet pays tribute to Derek K. Armstrong, who collected the fossils. At an estimated one metre in length, this extinct species is comparable to that of extant “giant eunicid” species colloquially referred to as “Bobbit worms”. CT scan reveal the maxillary plates entombed in the rock. The researchers conclude that the serendipitous discovery of multiple specimens from a monospecific assemblage in a limited number of fossil samples suggests that Websteroprion armstrongi was a common species at this particular part of the seabed, which went onto become strata within the Kwataboahegan Formation. The specimens likely represent a “snap-shot assemblages”, the remains of many individuals that were suddenly and rapidly buried by sediment. Ancient leg bones, found in Palaeocene-aged deposits located on the shoreline of Pegasus Bay near the city of Christchurch (New Zealand), has led scientists to propose that dinosaurs would have been familiar with penguins. In addition, the leg bone fossils indicate that after the dinosaurs died out, some penguins became super-sized, standing around 1.5 metres tall. The avian fossil material was excavated from sediments along the Waipara River, close to where this river meets the sea (Pegasus Bay). It has been estimated that this giant, primitive penguin lived in a coastal environment some 61 million years ago. Researchers from the Senckenberg Society for Natural Research (Frankfurt, Germany), have concluded that the penguin lineage is much older than previously thought, suggesting that these marine birds very probably evolved during the Late Cretaceous and the first kinds of penguins would have been very familiar to dinosaurs that wandered the remnants of the southern continent Gondwana. New specimen (left) compared to W. manneringi and an extant Emperor Penguin (Aptenodytes forsteri) on the right. The picture above compares the fossil leg bones of the newly discovered penguin species, with that of another, smaller Palaeocene penguin found in the same area Waimanu manneringi, which was formally described in 2006. The bones on the right are from the largest living species of penguin, the Emperor penguin (A. forsteri). This fossil supports the theory that the ancestors of modern Aves rapidly diversified after the end Cretaceous extinction event occupying a number of niches that had previously been occupied by other types of bird and Theropod dinosaurs. Penguins probably waddled next to dinosaurs. Although, Waimanu manneringi was a contemporary of the giant penguin, it had a different body plan, resembling a cormorant. The two types of penguin were very different, this suggests that basal penguins probably evolved prior to the end of the Cretaceous. The lack of autapomorphies (distinctive features) and the fragmentary nature of the fossils has deterred the researchers from seeking to name their new prehistoric bird. South Island giant penguin compared to modern human. The orientation of the leg bones suggests that, just like modern penguins, this ancient feathered friend probably waddled, walking in the same manner as its extant, smaller cousins. The fossil discovery is highly significant as it will likely be used as an “anchor point” to determine how the penguin family evolved. It is also very likely that other penguin species existed during the Palaeocene Epoch in this part of the world, but their fossilised remains have not yet been discovered. The scientists are optimistic that the fossil site, just twenty miles north of the city of Christchurch, will yield further evidence of ancient sea birds. Although, around twenty-five percent bigger than the largest penguin species around today (Emperor penguin), these fossils do not represent the largest penguin known to science. Penguins were not the only creatures around today, that would have been familiar to the dinosaurs. Everything Dinosaur wrote an article after research had been published back in 2008 that suggested the bizarre duck-billed platypus co-existed with duck-billed dinosaurs. Today, Everything Dinosaur has launched its new website, part of a major investment programme for the UK based specialist retailer of dinosaur models and toys. The site has been redesigned to make it much more user friendly, especially for those visitors that access Everything Dinosaur via a mobile device. The improved layout is easier to navigate and the customer breadcrumb trails and product search functions have been made more efficient and intuitive. The new front page of the Everything Dinosaur website. The site has improved security features to ensure that all customer data is held safely and in accordance with best practices for web-based retailers. New shipping options are being offered for the company’s growing number of international customers. For example, there are now tracked and signed options available for all countries that currently offer such postal services. Shipping costs, especially UK postage costs continue to be subsidised and a lot of dinosaur toys and models can still be sent out for just over £3.00 GBP, which represents remarkable value considering the rise in postage elsewhere on the Internet. Just like life on Earth, the new website is designed to be constantly evolving. Customers will find it easier to sign up for the company’s newsletter and shortly, FEEFO product ratings and customer reviews will be available to view on line. The streamlined and upgraded product categories will make shopping for dinosaur toys and games much easier and in the background, currently hidden from view and waiting to “go live”, are several new product areas, reflecting Everything Dinosaur’s expanding product range. Collectors of prehistoric animal models are going to have even more choice than ever, all thanks to Everything Dinosaur’s growing model and replica ranges. A new website layout for Everything Dinosaur. Customer feedback and opinions have been taken into consideration as part of the website improvement programme. A special category has been created to highlight new arrivals. This will help dinosaur fans to keep up to date with new products which have come into stock. In addition, the appearance and layout of all the products has been improved, helping customers to access top quality product images and lots more information on dinosaur models and other prehistoric animal themed toys and games. The new website is being hosted on a new platform. The shopping cart function has been improved and it is easier to navigate, toggling between the shop and the cart is quicker and more convenient. Naturally, Everything Dinosaur customers can be assured that as with the previous website, security is state of the art and the three-dimensional customer protocols are all in place to ensure that sensitive customer data is protected. The protection offered by the new website has been enhanced with new secure transactional gateways and upgraded site conduits. Everything Dinosaur has been trading on line for a dozen years or so, but the website domain including the blog site has been owned by the company for nearly twenty years. The launch of the new website, part of a continuous programme of customer service improvements, represents a new chapter in the history of the company dedicated to all things dinosaur. Unlike the Woolly Rhino, the giant prehistoric fish Dunkleosteus, Pterosaurs like Quetzalcoatlus and of course the non-avian dinosaurs – Everything Dinosaur is far from extinct! In fact, thanks to it’s enthusiastic team members and loyal customers, the company continues to thrive. The skull and jaws from a pair of giant rodents, that represent an extinct species that could have weighed as much as half a tonne, are helping to re-shape the rodent family tree. Study of these new fossils have led researchers to propose a formal revision of the three known species of the genus Isostylomys into just one species, Isostylomys laurillardi. The new fossils of the two rodents, an adult and a juvenile, paint a more complete picture of these extinct and massive rat-like animals. For example, the fossil discoveries raised questions about how these giant rodents were classified within their genus, and hint that several species that were thought to be related may instead be a single species. The fossils add to our knowledge regarding giant members of the Dinomyidae family and is helping palaeontologists to reappraise the phylogeny of this once diverse and speciose group of South American mammals. Isostylomys laurillardi (adult and juvenile). The fossil material comes from the exposed cliffs in the Río de la Plata coastal region of southern Uruguay. The fossils have been dated to the Miocene Epoch (9.5 to 10 million-years-ago approximately). The researchers, including lead author, Dr Andres Rinderknecht of the Museo Nacional de Historia Natural (Uruguay), examined the teeth and skulls of fossil specimens, comparing them to the bones and teeth of the largest living rodent the Capybara (Hydrochoerus hydrochaeris). The research team conclude that, due to similarities in the adult’s and the juvenile’s teeth structure, previously found fossils, which were smaller and thought to belong to a different species, were in fact from the same species. Skull in ventral view (A), skull and mandible in left lateral view (B), and mandible in occlusal view (C). The picture above shows the adult skull in ventral view seen from underneath, (A), and the skull and jaw viewed from the side (B). Picture (C) shows the jaw in occlusal view, the scale bar is five centimetres. The authors have consequently proposed that members of the subfamily Gyriabrinae could represent juveniles belonging to other subfamilies of Dinomyidae and that three known species of the genus Isostylomys should be merged into just one species, Isostylomys laurillardi. The adult remains found consist of an almost complete skull with a partial jaw, while the juvenile’s remains are of a complete lower jaw and the right calcaneum (heel bone). Almost all previous discoveries of this kind have consisted of isolated teeth, and small fragments of skulls or jaws, which make this discovery some of the best-preserved remains of giant dinomids known to science. “Making a Giant Rodent: Cranial Anatomy and Ontogenetic Development in the genus Isostylomys (Mammalia, Hystricognathi, Dinomyidae)”. By Andrés Rinderknecht, Enrique Bostelmann and Martin Ubilla, published by Taylor and Francis. The scientific paper: Access the scientific paper here. Back in March 2016, Everything Dinosaur published an article on the enigmatic “Tully Monster” (Tullimonstrum gregarium), a bizarre creature of coastal waters and estuaries, first described in 1966, but not classified until fifty years later. Trouble is, the proposal that this thirty-centimetre long, stalk-eyed animal was a vertebrate has been challenged. It seems that the mystery surrounding how to classify the State fossil of Illinois (fossils have only been found in the Mazon Creek area of Illinois and nowhere else in the world), has not been solved. Palaeobiologists at the University of Pennsylvania have challenged the idea that Tullimonstrum was a primitive fish with a proboscis. Writing in the academic journal “Palaeontology”, lead author Assistant Professor Lauren Sallan, (Dept. of Earth and Environmental Science) and her co-workers refute the vertebrate hypothesis. Sallan and colleagues, which include Robert Sansom (University of Manchester), postdoctoral researcher John Clarke, Zerina Johnason (Natural History Museum, London), Sam Giles (Oxford University), Ivan Sansom of the University of Birmingham and Philippe Janvier of France’s Muséum National d’Histoire Naturelle, postulate that that the two papers which seemingly settled the Tully Monster debate are flawed, failing to definitively classify it as a vertebrate. Two “Tully Monsters” in the shallow waters of Mazon Creek. The Tully Monster has been known since the 1950’s, when the first fossils were found in the Mazon Creek fossil beds in central Illinois. Since then, thousands of specimens have been identified from this locality, but they are not found anywhere else in the world. Looking at the history of classification, Sallan explained that at first it was thought to be some sort of marine worm, then it was proposed that it was a form of mollusc, like a sea-slug. Other palaeontologists have argued that this strange little animal has affinities with the Arthropoda, perhaps a distant relative of today’s shrimp. Then in 2016, two research papers were published proposing that T. gregarium was actually a member of the back-boned group of animals – a vertebrate. One study examined more than 1,200 Tullimonstrum fossils. In some, the researchers observed a light band running down the creature’s mid-line, which they interpreted as a notochord, a kind of primitive backbone. They also said it contained other internal organ structures, such as gill sacs, that identified it as a vertebrate, and that the animal’s teeth resembled those of a lamprey. Assistant Professor Sallan and her colleagues noted that these conclusions are based on a misunderstanding of how fossils in Mazon Creek are preserved. The Tully Monster samples come from what was once a muddy estuarine area and at Mazon Creek, internal soft tissues are very rarely preserved. Lamprey fossils have been found in the Mazon Creek area and these fossils are markedly different from their supposed relative the Tully Monster. In the other 2016 study, the researchers reported that scanning electron microscope images of the Tully Monsters’ eyes had revealed structures called melanosomes, which produce and store melanin. That paper’s authors argued that the complex tissue structure they saw in the animals’ eyes indicated it was likely a vertebrate. The Pennsylvania University led team counter this point by arguing that many Arthropods and Molluscs, also have complex eyes. “So the problem is, if it does have cup eyes, then it can’t be a vertebrate because all vertebrates either have more complex eyes than that or they secondarily lost them. But lots of other things have cup eyes, like primitive chordates, molluscs and certain types of worms,” the Assistant Professor stated. In this research, not one of more than a thousand fossil specimens studied appeared to possess structures that are believed to be universal in aquatic vertebrates, namely otic capsules, components of the ear that allow animals to balance and a lateral line, a sensory structure along the flanks that enables fishes to orient themselves and to detect their surroundings. Comparing the “Tully Monster” to other creatures. It looks like, for the time being at least the “Tully Monster” has lost its backbone. Team members from Everything Dinosaur at a trade fair in Germany met up with some very talented model makers and artists. A company called “Clay Works”, which is based in Singpore, were promoting their brand of very malleable clay, that once air dried sets solid. In order to demonstrate what the clay could do, the company had asked a team of very clever and skilled model makers to make a prehistoric landscape. Everything Dinosaur team members were most impressed, the entire landscape with its cast of dinosaur and prehistoric animal characters had taken more than three weeks to build. A prehistoric scene made from clay. The company’s trade stand certainly looked most inviting and we were allowed to touch and handle some of the models. The artists were happy to chat and to explain how the prehistoric landscape came about. They were genuinely, very fond of their prehistoric creations, even cuddling some of the sea monsters that they had made. Is That a Kronosaurus You’re Cuddling? A sea monster model made from clay. The number of different prehistoric animals on display was most impressive, the model makers had taken great care to make the models and the prehistoric scene that they had created was a sheer delight. Well down to Clay Works, we hope you had a prosperous trade show. A wonderful prehistoric landscape created using modelling clay. The fauna and flora of South America has always fascinated scientists and academics. Animals that are around today, such as the giant otter, the bizarre peccary, anacondas and the jaguar, which pound for pound has the strongest bite of any living big cat, are mere shadows of what was once an astonishing menagerie, the likes of which were found nowhere else on Earth. The public’s imagination has been fuelled by tales of the monsters that once roamed this continent. American palaeontologist and author Donald Ross Prothero builds on this legacy in his new book “Giants of the Lost World” which documents and describes the incredible prehistoric animals that once dominated South America, many of which truly deserve the mantle of “monsters”! “Giants of the Lost World” by Donald R. Prothero. Professor Prothero gently guides the reader through the history of research and study of the many extinct prehistoric animals of South America, but first he sets the scene. He discusses the work of Sir Arthur Conan Doyle who wrote the adventure story “The Lost World” in 1912. In Conan Doyle’s tale, plucky Professor Challenger leads a party of explorers to the top of a remote and isolated plateau discovering that dinosaurs and flying reptiles had survived into the 20th Century. This influential novel has been the basis of many films, radio programmes and television series. Sir Arthur was very probably inspired by the accounts of his good friend Percy Harrison Fawcett, who led an expedition to the Huanchaca Plateau (Bolivia) and encountered many strange animals that live atop the rocky plateau which rises upwards of nine hundred metres above sea level. In truth, the non-avian Dinosauria and their kin are long gone, but the fossil assemblage left behind documents a remarkable prehistoric fauna, that once helped shape the thinking of Charles Darwin. The largest land animals known to science (Titanosaurs) and some of the huge carnivores that preyed upon them, are discussed and the author skilfully updates readers on the fascinating debate about which was the biggest land carnivore of all – look out for the section comparing mega-sized carcharodontosaurids with the equally impressive Spinosaurs. South America was home to a whole host of unusual meat-eating dinosaurs from the stumpy-limbed Alvarezsauridae with their reduced digits, to the “raptors”, ferocious Deinonychosaurs and the truly odd, apex predators, the abelisaurids. This book is crammed full of fascinating facts and information that will delight both dinosaur fans and the general reader. A spectacular photograph of the bizarre South American abelisaurid Carnotaurus (C. sastrei). “Giants of the Lost World” is jam-packed with photographs, colour plates and beautiful illustrations. Look out in particular for the detailed images included in this most informative text by the very talented Nobumichi Tamura. We congratulate the author, for his provision of helpful notes and explanations that accompany the images and the very straight-forward and matter-of-fact manner in which he tackles quite complex and challenging areas of current palaeontological research, such as unravelling the family tree of the Sloths and their relatives (Xenarthra). After all, who can’t help but be intrigued with chapter titles such as “Killer Opossums”, “The Slow Folk” and “Pseudo-Elephants”! As a specialist in mammalian evolution, Professor Prothero is an ideal candidate to document and explain the evolutionary history of the marsupials and placentals that once thrived in South America. Some of these strange creatures migrated northwards, when South America’s isolation ended around three million years ago. You might be familiar with the Smilodon fossils of the La Brea tar pits of Los Angeles, but the largest of the Smilodon species was a resident of the southern portion of the Americas (S. populator), it would have dwarfed the Sabre-Toothed Cats of the United States and was one of the largest felids to have ever lived. A view of the skull of a Smilodon. The dinosaurs did not hold the monopoly when it came to giant reptiles. After the demise of the “terrible lizards”, new reptilian monsters evolved. The immense fossilised shell of a super-sized turtle (Stupendemys), is proof that monstrous reptiles lived in South America as recently as five million years ago. The bus-sized Titanoboa is discussed in detail and for fans of crocodiles, this book has plenty to sink your teeth into too. You might be familiar with apex predators such as the fourteen-metre-long “super caiman” Purussaurus, known from Colombia, Brazil and Peru, but “Giants of the Lost World” contains one or two crocodilian surprises as well. Check out the curious Mourasuchus, which matched Purussaurus in terms of size, but it may have fed in a similar way to a giant duck! Everything Dinosaur’s copy of “Giants of the Lost World”. This highly informative and well-written book draws to a close with an epilogue that takes a sanguine tone, reflecting on the threats to the existing wildlife of South America, much of which is critically endangered. Professor Prothero concludes that the extant animals and plants of this enigmatic continent may only be a shadow of a once mighty and monstrous assemblage, but there is still time to reverse the habitat destruction and climate change that threatens to erase the remnants of an amazing biological legacy. This excellent book does much to raise awareness concerning the diverse and eclectic cast of prehistoric characters that once roamed South America. Highly recommended. Title: “Giants of the Lost World: Dinosaurs and Other Extinct Monsters of South America” by Donald R. Prothero.